Woodworking ain’t easy – that’s the very first lesson we all learn – and while it’s certainly true it’s also what makes it so enticing and exciting to master. As someone who’s been in the game for decades, I’ve distilled all of my knowledge into 5 powerful tips that if followed, will propel you into becoming a woodworking pro. They’re easy to accomplish, quick to put into practice and best of all – effective. Now let’s dive in! You can’t imagine how much of a difference this makes. When I started working on some pieces myself I either had the luck of being able to use my father’s excellent tools (when he wasn’t working) or I had to make do with my small selection of sub-par tools. This gave me a first-hand look at just how great the gap is between good tools and bad ones in terms of time, effort and quality. As soon as I made my first few bucks, I instantly started to invest in quality tools and it was the best decision I’ve ever made – the pieces came out looking much better, took less time to finish and I had one heck of a better, less stressful time. While the work you want to do and budget are both important to decide which tools to get, always go for top-shelf products as they’ll last a lifetime and produce unbeatable results, giving you your money’s worth ten-fold. Don’t forget the tables and sawhorses. For choosing the most suitable sawhorse view more here. If you’re a beginner, get a powerful, high-quality random orbital sander. They’re super versatile and can take on any task while delivering beautiful, fool-proof results. It will be the most used tool of your woodworking arsenal. If you’re a professional, get yourself one of these drum sanders. They’ll not only allow you to complete pieces in less than half the time that you take currently but the quality of the results is also unmatched. Out of all the purchases I’ve made, getting my very first drum sander was the most impactful, and worthwhile one. If what you want is quality, you need to get your very own shop. From the usefulness of having all the tools at an arm’s reach to the comfort and concentration that a dedicated crafting space gives, it’s the only way to really get professional-level results. No more worrying about making a mess and no more worrying about making noise, this is your shop and you’re free to go wild. This opens up the doors to creativity and puts you at ease, making your work much more interesting and well-done. 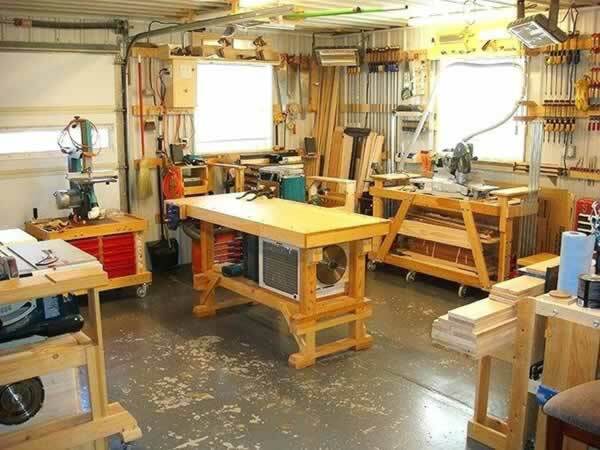 It’s possible to get a fantastic shop even if you only have a small room so no more excuses – time to set up your very own workshop! With or without a dedicated workshop, an essential part of ensuring the utmost quality of your work is to have a clean environment. This means that both the air and surfaces of your work space should be as clean as a whistle – protecting no only your health but also the quality of your work. While some power tools have built-in dust extraction systems, they’re mostly weak and not a solution you can count on so you’ve gotta get yourself the ace under every pro woodworker’s sleeve – a dust collector. They’re affordable, powerful, portable and can be hooked to any type of power tool you have, completely solving the cleanliness issue. Not only do they prevent debris from covering the surfaces you’re working on but most importantly, they efficiently eliminate all the harmful dust flying around which allows you to work without a mask and be much more comfortable in general. This is an often overlooked little trick that’s absolutely essential if you want to move on up to the next level. Yeah I know what you’re thinking – “obviously, practice makes perfect” – and you’re right, it absolutely does. The issue is that many people never improve because they don’t practice enough, they stick to reading about woodworking projects and tools but don’t get their hands dirty often enough. Pick up some beaten up old furniture or a few random wooden pieces and go to town, get creative, be bold, it’s a surefire way to improve. It doesn’t matter if you screw up, that’s exactly what makes you better – finding and fixing your mistakes. So stop procrastinating, pick up a few pieces of wood and get to work! While I attribute nearly everything I know about woodworking to my father and personal experience, there’s one thing you need to do in order to constantly improve – you have to learn from the best. I’m not talking about only reading from experienced professionals, which is helpful as well, but to actually go out there and find some that can mentor you in real life. Most often than not you can find a few right next to your door and I promise that they’ll be eager to help you get better. There are also some dedicated classes and workshops that you can attend with other people which is also a fantastic way to learn new skills and techniques. If you want to get to the top and stay there, this is an unmissable part of your journey. Woodworking’s hard when you’re just starting but remember that it’s part of the fun. With the right tools, space, practice and teachers, you’ll be on your way to woodworking stardom in no time. The most important part is to simply start – make this article your checklist and start putting these tips into practice right now. You’ll thank me, and yourself, later! This article is a contribution from James Draper who is a professional woodworker that got his passion for sanding passed down from his father. He loves to bring a new life to old, dusty furniture. You can find him on sanderscore.com where he shares his knowledge on sanding and craftsmanship with other people as best as he can.